Kylee Keitlah, Ahousaht, is one of three recipients of the Eileen Haggard Memorial Scholarship. She is pictured here with Ted Haggard. The other two recipients are Colten Van Der Minne of Tla-o-qui-aht and Corina Ambrose of Ehattesaht. The celebration was two-fold, starting with scholarship presentations to students ranging from elementary school grade one all the way to post-secondary colleges and universities. Each year the Nuu-chah-nulth Tribal Council provides scholarships to select Nuu-chah-nulth students from grades one to 12. Rather than go through a selection process for primary grades, the NTC education department selects winners by random draw. There were 54 Nuu-chah-nulth grades one-to-three winners and each was called up to receive recognition. 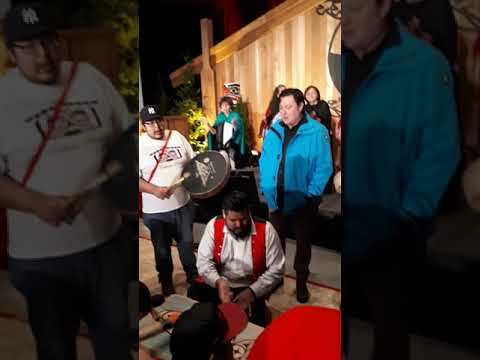 The event started with cultural protocols including ta’ilthma – support for grieving families before the singing of the Nuu-chah-nulth song. Hupacasath Elected Chief Steven Tatoosh and Richard Watts of Tseshaht First Nation offered warm words of welcome on behalf of their respective nations. Master of Ceremonies, Ian Caplette, reminded everyone that people traveled a long way to come celebrate the strengths and success of Nuu-chah-nulth students. It was a great day for them, he added. NTC President Judith Sayers and VP Andy Callicum welcomed the people on behalf of the Nuu-chah-nulth Tribal Council. “Today we’re going to lift up and honor those that have graduated and those that won scholarships; we are building a strong Nuu-chah-nulth nation, degree-by-degree,” said Sayers. More than 100 scholarships were handed out to deserving Nuu-chah-nulth learners throughout the evening. Following a catered dinner, more than 60 Nuu-chah-nulth grade 12 graduates and 41 post-secondary graduates were recognized. The celebration started with the grad procession; each graduate was escorted to the stage; some by RCMP members dressed in Red Serge, others by close family members. The graduates ranged in age from late teens to elders. Each nation was provided an opportunity to recognize each of their graduates with gifts and words of encouragement and congratulations. Guest speaker Ehattesaht Grade 12 graduate Corina Ambrose talked about her struggles to complete her high school education. It started, she said, with a terminal cancer diagnosis for her late father, who fought for eight months before losing his battle. Still struggling with grief and depression, she lost another close family member. Fighting through tears, she spoke of the depths of her depression. With family support she was able to overcome her challenges and now she is grateful that she finished school, thankful to all those that supported her along the way. Ambrose congratulated her fellow graduates and wished them well in their futures.